The Bonanno crime family is one of the "Five Families" that dominate organized crime activities in New York City, and in the United States, as part of the criminal phenomenon known as the American Mafia. A cigar is a rolled bundle of dried and fermented tobacco leaves made to be smoked. They are produced in a wide variety of sizes and shapes. Since the 20th century, almost all cigars are made up of three distinct components: the filler, the binder leaf which holds the filler together, and a wrapper leaf, which is often the best leaf used. 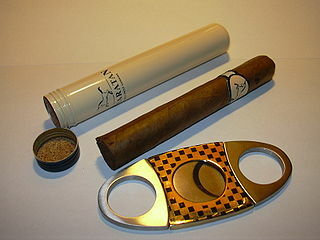 Often the cigar will have a band printed with the cigar manufacturer's logo. Modern cigars often come with 2 bands, especially Cuban Cigar bands, showing Limited Edition bands displaying the year of production. East Harlem, also known as Spanish Harlem or El Barrio, is a neighborhood of Upper Manhattan, New York City, roughly encompassing the area north of the Upper East Side and East 96th Street up to roughly East 142nd Street east of Fifth Avenue to the East and Harlem Rivers. It lies within Manhattan Community District 11. Despite its name, it is generally not considered to be a part of Harlem. 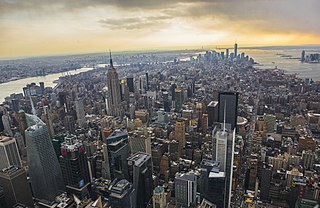 Manhattan, often referred to locally as the City, is the most densely populated of the five boroughs of New York City and its economic and administrative center, cultural identifier, and historical birthplace. The borough is coextensive with New York County, one of the original counties of the U.S. state of New York. The borough consists mostly of Manhattan Island, bounded by the Hudson, East, and Harlem rivers; several small adjacent islands; and Marble Hill, a small neighborhood now on the U.S. mainland, physically connected to the Bronx and separated from the rest of Manhattan by the Harlem River. Manhattan Island is divided into three informally bounded components, each aligned with the borough's long axis: Lower, Midtown, and Upper Manhattan. Castellammare del Golfo is a town and Municipality in the Trapani Province of Sicily. The name can be translated as "Sea Fortress on the Gulf", stemming from the medieval fortress in the harbor. The nearby body of water conversely takes its name from the town, and is known as Gulf of Castellammare. Galante owned the Rosina Costume Company in Brooklyn, New York  and was associated with the Abco Vending Company of West New York, New Jersey. West New York is a town in Hudson County, New Jersey, United States, situated upon the New Jersey Palisades. As of the 2010 United States Census, the town's population was 49,708, reflecting an increase of 3,940 (+8.6%) from the 45,768 counted in the 2000 Census, which had in turn increased by 7,643 (+20.0%) from the 38,125 counted in the 1990 Census. The Lower East Side, sometimes abbreviated as LES, is a neighborhood in the southeastern part of the New York City borough of Manhattan, roughly located between the Bowery and the East River, and Canal Street and Houston Street. Traditionally an immigrant, working class neighborhood, it began rapid gentrification in the mid-2000s, prompting the National Trust for Historic Preservation to place the neighborhood on their list of America's Most Endangered Places. 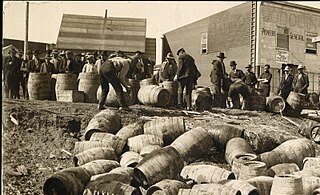 Prohibition is the act or practice of forbidding something by law; more particularly the term refers to the banning of the manufacture, storage, transportation, sale, possession, and consumption of alcoholic beverages. The word is also used to refer to a period of time during which such bans are enforced. By 1940, Galante was carrying out "hits" for Vito Genovese, the official underboss of the Luciano crime family. 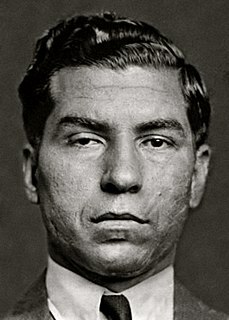 Galante had an underworld reputation for viciousness and was suspected by the New York Police Department (NYPD) of involvement in over eighty murders. Galante reportedly had a cold, dead-eyed stare with eyes that betrayed an utter indifference to human life, scaring both law enforcement as well as other Mafia members. Ralph Salerno, a former New York Police Department detective, once said, "Of all the gangsters that I've met personally, and I've met dozens of them in all of my years, there were only two who, when I looked them straight in the eye, I decided I wouldn't want them to be really personally mad at me. Aniello Dellacroce was one and Carmine Galante was the other. They had bad eyes, I mean, they had the eyes of killers. You could see how frightening they were, the frigid glare of a killer." In November 1974, the Commission designated Philip "Rusty" Rastelli as the official boss of the Bonanno family. However, Rastelli was soon sent to prison and Galante seized effective control of the family. 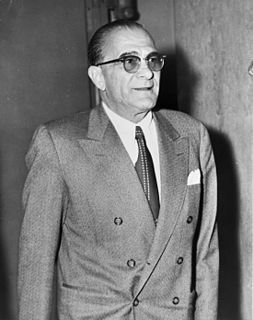 As a former underboss, Galante considered himself the rightful successor to Joseph Bonanno, a man to whom he had always remained loyal. On March 3, 1978, Galante's parole was revoked by the United States Parole Commission and he was sent back to prison. Galante had allegedly violated parole by associating with other Bonanno mobsters. However, on February 27, 1979, a judge ruled that the government had illegally revoked Galante's parole and ordered his immediate release from prison. By this stage, Galante was bald, bespectacled and had a stooped walk. Those involved in the murder were later identified as Anthony "Bruno" Indelicato, Dominick Trinchera, Dominick Napolitano and Louis Giongetti. These men were hired by Alphonse Indelicato. [ citation needed ] However, in Philip Carlo's 2009 book "Ice Man: Confessions of a Mafia Contract Killer", Carlo writes that serial killer and Mafia hitman Richard Kuklinski ("IceMan") participated in Galante's killing. He had gone to the restaurant ahead of time, ate a meal and waited for Galante to arrive. Kuklinski, Carlo writes, got up from his seat, walked to the back and pulled a shotgun out from under his coat, and shot Galante and his bodyguards. Three men also arrived at the time Kuklinski began shooting and finished Galante and his men off. Carlo reports that Kuklinski was retained by Roy DeMeo on behalf of the Gambino family's participation in the Commission's agreement to kill Galante. The Roman Catholic Archdiocese of New York refused to allow a funeral mass for Galante due to his notoriety. Galante was buried at Saint John's Cemetery in Middle Village, Queens. Vito "Don Vitone" Genovese was an Italian-American mobster who rose to power during Prohibition as an enforcer in the American Mafia. 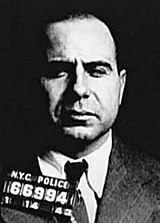 A long-time associate and childhood friend of Charles Luciano, Genovese took part in the Castellammarese War and helped shape the rise of the Mafia and organized crime in the United States. 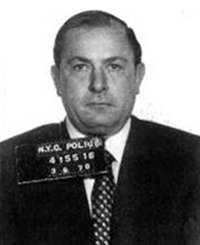 He would later lead Luciano's crime family, which was renamed the Genovese crime family by the authorities. Zips is a slang term often used as a derogatory slur by Italian American and Sicilian American mobsters in reference to newer immigrant Sicilian and Italian mafiosi. The name is said to have originated from mobsters' inability to understand the faster-speaking Sicilian dialects, which appeared to "zip" by. Other theories include pejorative uses such as Sicilians' preference for silent, homemade zip guns. According to still another theory, the term is a contraction of the Sicilian slang term for "hicks" or "primitives." The older Sicilian mafiosi of the pre-Prohibition era known as "Mustache Petes" were also referred to as "zips". Alphonse "Sonny Red" Indelicato was a caporegime in New York City's Bonanno crime family who was murdered with two other capos in an infamous gangland slaying. The Genovese crime family is one of the "Five Families" that dominate organized crime activities in New York City and New Jersey as part of the Mafia. The Genovese crime family are rivaled in size only by the Gambino crime family, and are unmatched in terms of power. They have generally maintained a varying degree of influence over many of the smaller mob families outside New York, including ties with the Philadelphia, Patriarca, and Buffalo crime families. 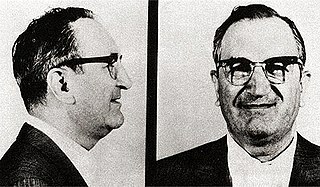 The Mafia Commission Trial, officially known as United States v. Anthony Salerno, et al., was a criminal trial in New York City, United States. Using evidence obtained by the Federal Bureau of Investigation, eleven organized crime figures, including the heads of New York's so-called "Five Families," were indicted by United States Attorney Rudolph Giuliani under the Racketeer Influenced and Corrupt Organizations Act (RICO) on charges including extortion, labor racketeering, and murder for hire. The case struck a blow against "The Commission," a loose organization of the New York Mafia organizations that met to resolve disputes or discuss criminal activities, sometimes likened to organized crime's board of directors. Time magazine called this "Case of Cases" possibly "the most significant assault on the infrastructure of organized crime since the high command of the Chicago Mafia was swept away in 1943," and quoted Giuliani's stated intention: "Our approach... is to wipe out the five families." The Colombo crime family is the youngest of the "Five Families" that dominates organized crime activities in New York City, United States, within the nationwide criminal organization known as the Mafia. It was during Lucky Luciano's organization of the American Mafia after the Castellammarese War, and the assassinations of Giuseppe "Joe The Boss" Masseria and Salvatore Maranzano, that the gang run by Joseph Profaci was recognized as the Profaci crime family. See also: 1978 in organized crime, other events of 1979, 1980 in organized crime and the list of 'years in Organized Crime'. Gerlando "George from Canada" Sciascia, was a New York City mobster, and a caporegime of the Bonanno crime family, who was also the Sixth Family's representative from New York, and was a major narcotics trafficker in Canada, and the United States. Cesare "The Tall Guy" Bonventre was a Sicilian mobster and caporegime for the New York City Bonanno crime family. Over four days, between October 12–16, 1957, the American gangster Joseph Bonanno allegedly attended a series of meetings between some high-level Sicilian and American mafiosi in the Grand Hotel et des Palmes in Palermo, Sicily – the most splendid in town at the time. The so-called 1957 Palermo Mafia summit has become a legendary landmark in the international illegal heroin trade in popular Mafia non-fiction. The question is if it ever took place. The details of it are still shrouded in mystery. According to some, one of the main topics on the agenda was the organisation of the heroin trade on an international basis. The FBI believed it was this meeting that established the Bonanno crime family in the heroin trade. Christopher "Christie Tick" Furnari, Sr. was a Lucchese crime family mobster. During the 1980s, Furnari served as the family consigliere until his 1986 racketeering conviction. He was sentenced to 100 years in prison before being released in 2014 after serving almost 28 years. Anthony "Bruno" Indelicato, also known as "Bruno" and "Whack-Whack", is a capo with the Bonanno crime family of New York City. 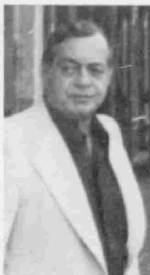 Michael "Mimi" Sabella (1911–1989) was a caporegime in the Bonanno crime family and a relative of Philadelphia crime family mob boss Salvatore Sabella. Philip Giaccone also known as "Philly Lucky" and "The Priest" was a Bonanno crime family member who was murdered by loyalists of crime boss Joseph Massino. Nicholas Angelo "Nicky Mouth" Santora is the reputed underboss of the Bonanno crime family. Salvatore T. "Tom Mix" Santoro, Sr. served as underboss in the Lucchese crime family during the 1980s before being convicted in the Mafia Commission Trial and sentenced to 100 years in federal prison. Philip "Rusty" Rastelli was a New York mobster and former boss of the Bonanno crime family, though he spent all but two years of his reign in prison. 1 2 Raab, Selwyn (July 13, 1979). "Galante's Image Belied Role He Played in Life" (PDF). New York Times. Retrieved 17 January 2012. 1 2 3 4 5 6 7 "Carmine Galante Part 1 of 12". FBI Records - The Vault. Retrieved 24 January 2012. 1 2 3 "Carmine Galante Part 2 of 12". FBI Records: The Vault. Retrieved 24 January 2012. ↑ "Assassin Slays Tresca, Radical, In Fifth Avenue". New York Times. January 12, 1943. ↑ Franks, Lucinda (February 20, 1977). "Obscure Gangster Emerging as Mafia Chief in New York" (PDF). New York Times. Retrieved 13 January 2012. 1 2 Capeci, Jerry (2004). The complete idiot's guide to the Mafia (2nd ed.). Indianapolis, IN: Alpha Books. ISBN 1-59257-305-3. 1 2 Amoruso, David. "How the Sicilian Mafia flooded the US with heroin". Gangster Inc. Retrieved 24 January 2012. ↑ Ranzal, Edward (June 4, 1959). "Fugitive is Seized in Narcotics Case" (PDF). New York Times. Retrieved 17 January 2012. ↑ "Galante Gives Up" (PDF). New York Times. May 18, 1960. Retrieved 18 January 2012. ↑ "Mistrial is Ruled in Narcotics Case" (PDF). New York Times. May 16, 1961. Retrieved 19 January 2012. ↑ "13 Are Sentenced in Narcotics Case" (PDF). New York Times. July 11, 1962. Retrieved 19 January 2012. ↑ Sifakis, Carl (2005). The Mafia encyclopedia (3. ed.). New York: Facts on File. pp. 51–52. ISBN 0-8160-5694-3. 1 2 "Judge Orders Release of Galante from Jail" (PDF). New York Times. February 28, 1979. Retrieved 19 January 2012. ↑ Lubasch, Arnold H (March 4, 1978). "Commission Revokes Galante's Probation" (PDF). New York Times. Retrieved 19 January 2012. ↑ Sifkakis, Carl (2005). p. 443. ↑ Raab, Selwyn (2006). Five families : the rise, decline, and resurgence of America's most powerful Mafia empires (1st St. Martin's Griffin ed.). New York: Thomas Dunne Books. ISBN 0-312-36181-5. ↑ McFadden, Robert D. (July 13, 1979). "Galante and 2 Shot to Death in Brooklyn Restaurant" (PDF). New York Times. Retrieved 20 January 2012. ↑ Reppetto, Thomas A. (2007). Bringing down the mob : the war against the American Mafia. New York: Henry Holt. p. 185. ISBN 0-8050-8659-5. ↑ McFadden, Robert D. (July 16, 1979). "Archdiocese Denies Request for Galante Funeral Mass" (PDF). New York Times. Retrieved 18 January 2012. ↑ Sifkakis, Carl (2005). p. 53. ↑ Lubasch, Arnold H. (January 14, 1987). "JUDGE SENTENCES 8 MAFIA LEADERS TO PRISON TERMS". New York Times. Retrieved 25 January 2012. ↑ Carlo, Philip (2009). The Ice man : confessions of a mafia contract killer (1st ed.). New York: St. Martin's Paperbacks. p. 300. ISBN 0-312-93884-5. Pistone, Joseph D.; & Woodley, Richard (1999) Donnie Brasco: My Undercover Life in the Mafia , Hodder & Stoughton. ISBN 0-340-66637-4.